Clicker Training A Horse - My horse is not interested in the target? Clicker Training A Horse – My horse is not interested in the target? I’ve had this experience with my miniature donkey. Every time I presented him with the target in the beginning he would either turn his head as if to say “you’ve got to be kidding you want me to touch that” or he would walk away. I had to break things down for him to help him be successful. What I did was kneel down to his level so he would feel comfortable. I only did this because of him being a miniature. If I was working with a big horse I would not be kneeling down. I then took something my donkey was familiar with and placed it close to him. I used his feed bucket. Every time he touched it I clicked and rewarded him with a treat. After he was consistent at touching his feed bucket I started picking it up and holding it in front of him and he would target the bucket. I made sure I kept my sessions short around 5 minutes because I wanted him to develop a strong desire to target his feed bucket that I was holding in front of him. When he was consistent with targeting the feed bucket held in front of him I then switched to my regular target. Every time he looked at the target I would click and reward him. If they offer to touch the regular target be sure to click and reward them for that as some will want to look at it when you switch over and others will immediately touch the target. 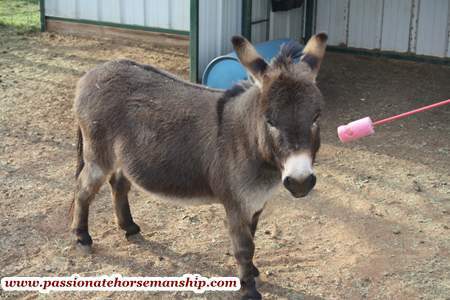 In my case it did not take long for my miniature donkey to touch the regular target. The next step in the process would be to have him touch the target when it was low and then with it higher. When you put the target higher make sure it is not where they have to stretch to reach it just a little higher than eye level will do. After they are doing that consistently then you can have them follow the target. Do not move on until they are consistent with the previous 2 steps. Following the target will come in handy for tasks later on like trailer loading. If you run into this challenge with your horse be creative and think of ways you can break things down setting them up for success. There are all kinds of things you can use for targets such as a ball, cone, rubber buoy (Wal-Mart has them), brush etc…. I always make sure I go back to using my regular hand held target because like I stated above it will come in handy later on. Have you had this challenge with your horse? If so tell me in the comment section below what you did to help your horse out as I would love to hear about your experience. Need help with clicker training? Contact me today to schedule your lesson.